High Times! Drugs To Make You More Clever! Put this way, sipping coffee sounds more like an abomination than the world’s most accepted form of drug abuse. But centuries of familiarity have put people at their ease. In the coming years science is likely to create many novel drugs that boost memory, concentration and planning. These may well be less harmful than coffee—and will almost certainly be more useful. But will people treat them with as much tolerance? The new cognition-enhancing drugs are designed to treat debilitating diseases such as Alzheimer’s, attention-deficit disorder and schizophrenia. But because they act deep in neural pathways of the brain, some of them are bound also to enhance people’s power to think and learn (see article). Such drugs will inevitably be used by healthy people too. That is the lesson from medicines such as Ritalin (methylphenidate) and Provigil (modafinil), which are now widely used “off label” to boost performance, as Nature has found. When the British journal asked its scientifically aware readers earlier this year, one in five of those who answered said they had used such drugs non-medically, to help them concentrate or learn. Futile, because if people really want medicines, they can easily get hold of them. Nature‘s drug users procured their stashes from prescriptions from doctors or over the internet. As anyone with an e-mail address knows, the difficulty is not scarcity, but keeping the offers for Viagra, real or fake, at bay. Some worry about the unfair advantage and peer pressure that comes from these drugs. However, millions suffer from untreated but mild memory loss. Is it fair to deny them help? If the shy or the scatterbrained take cognitive enhancers, it is not obvious whether this is levelling their playing field or giving them an unfair advantage. Is it “natural” to prop up the ageing body with a nip and a tuck, but to restrict help for the aging mind to brain-training on the Nintendo? There will always be risks, but no more than for other medicines. Remember that the new drugs will have passed clinical trials because they are treatments for a disease, even if they have not been licensed as cognitive enhancers. There will be a lot of habitual off-label takers, more people than in the trials, so the regulators need to monitor them for side-effects—especially in children. 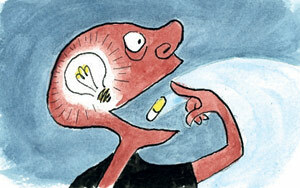 But detailed and accessible information about the side-effects of drugs is to everyone’s advantage. This entry was posted on Thursday, July 17th, 2008 at 10:54 am and is filed under Off Beat. You can follow any responses to this entry through the RSS 2.0 feed. You can leave a response, or trackback from your own site. 2 Responses to High Times! Drugs To Make You More Clever!